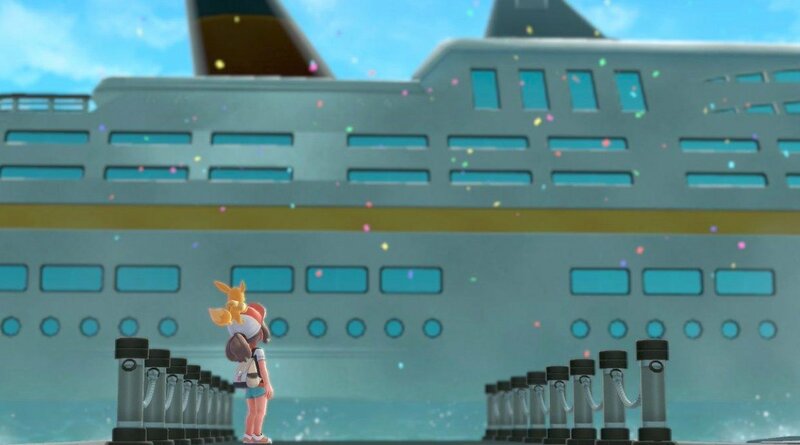 In Pokemon: Let’s Go, you won’t be able to board the S.S. Anne in Vermillion City without first acquiring a set of S.S. Anne tickets. While the process of getting tickets to the S.S. Anne isn’t particularly challenging, figuring out where to go and who to talk to can be somewhat confusing. If you’re unsure where to begin your search, or you have the S.S. Anne tickets but don’t know what to do with them, read on to learn more about the S.S. Anne in Pokemon: Let’s Go! The S.S. Anne is a ship in Pokemon: Let’s Go that docks at the port in Vermillion City. 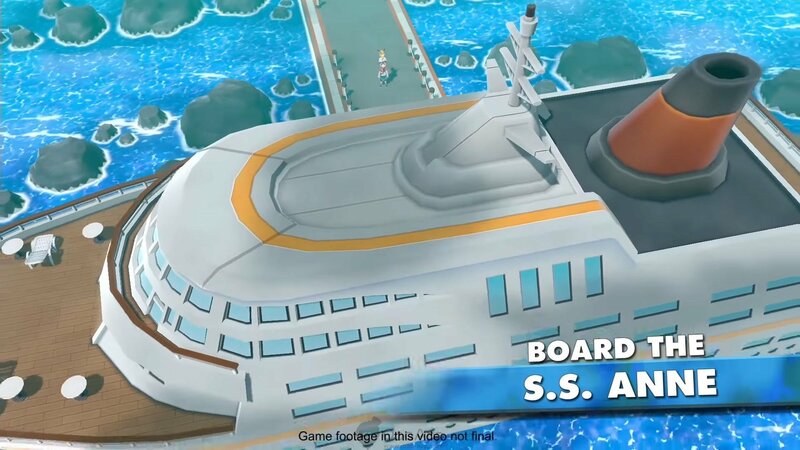 To board the ship, you’ll first need to obtain S.S. Anne tickets. These tickets can’t be obtained in Vermillion City itself. Instead, you’ll need to journey to Cerulean City to find them. After you arrive in Cerulean City, heal your Pokemon at the Poke Center, then make your way North until you encounter the Nugget Bridge. By battling and defeating all Trainers on the Nugget Bridge, you’ll earn a free Nugget which can be sold for a high price at Poke Stops. At the end of the Nugget Bridge, take a right and continue heading East through the cluster of Trainers until you reach a small house. This is Bill’s House, and inside you’ll find a talking Pokemon in the form of Nidorino. The Nidorino will explain that he is actually Bill, and will request your help in returning him to his normal human state. By using Bill’s computer when he prompts you to, you’ll be able to return Bill to normal. As a reward, Bill will give you the S.S. Anne tickets needed to board the ship. He gives you a pair of these tickets, meaning you can give some to your friendly Rival (who will later meet you aboard the ship). With the S.S. Anne tickets, return to Vermillion City and make your way South to the port where the ship is docked. 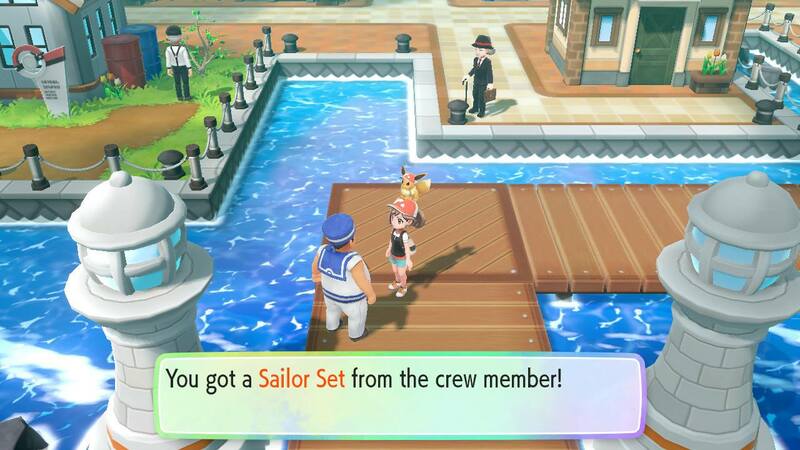 Show your tickets to the Sailor right outside the ship and you’ll get a free Sailor Outfit Set for you and your Pokemon (Eevee or Pikachu) to wear. After that, you can board the ship and begin exploring. There are several Trainers in each room whom you can battle, and when you reach the upper levels of the ship, you’ll be able to speak with the seasick Captain. After patting him on the back, the Captain will teach you a Secret Technique called Chop Down. Chop Down replaces the HM called “Cut” found in previous Pokemon titles, though it works in the same way. Note that you can’t actually ride on the S.S. Anne and that no matter how long you stay aboard the ship, it won’t actually begin to sail. When you’re done exploring, exit the ship. Immediately upon exiting, the ship will leave as you and your Pokemon stare on in wonder. With the ship gone, you can use your newly learned Secret Technique to Chop Down the small tree blocking the way into the Vermillion City Gym! Did you have any trouble finding tickets to the S.S. Anne? What do you think of the Sailor Outfit Set you get before you board the ship? Let us know down in the comments below!